Sketch J Showing the Progress of the Survey in Section No. X (middle sheet) From pt. Sal to Tomales Bay. 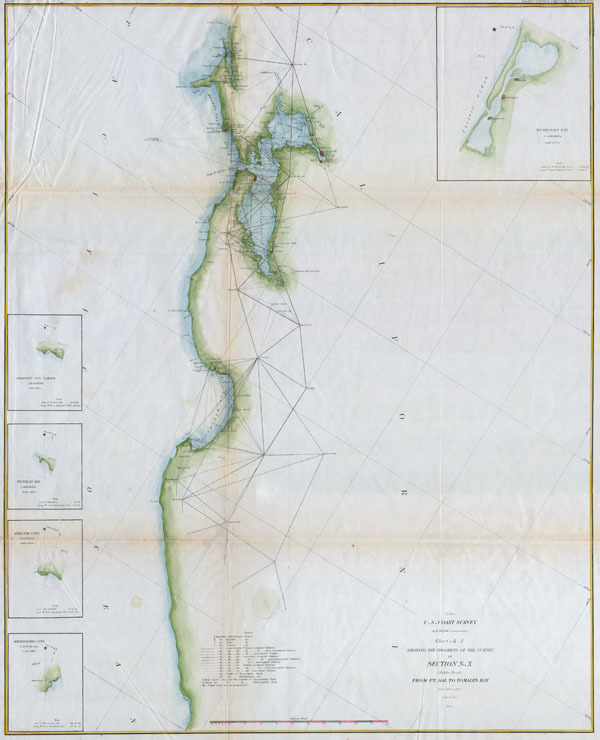 A rare nautical triangulation chart of the California coast from Pt. Sal to Tomales Bay, including the San Francisco Bay area, by the U. S. Coast Survey, 1857. Depicts the much of the shoreline of southern California with numerous notations regarding the various ports and sailing references. Produced in 1857 under the Supervision of A. D. Bache, the most influential leader of the Coast Survey. Dated. Very Good condition. Minor repair to lower left margin. Blank on verso. Minor browning on original folds (see photo).